Spiced Apples and Pears - A recipe from Savor California, the online showcase for extraordinary gourmet foods and beverages from California. 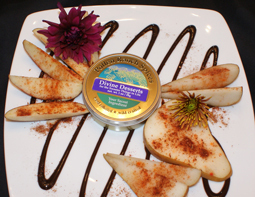 Sprinkle apple and pear slices with Pollen Ranch's Divine Desserts spice blend. Delicious topped with vanilla ice cream and drizzled with chocolate sauce.